Even for someone who is truly intrigued by air purifier technology, I have to say that it’s kind of hard to give the final verdict on which models are the best. However, I have come to the conclusion that this particular air purifier I’m about to introduce to you belongs to the top 10 list. 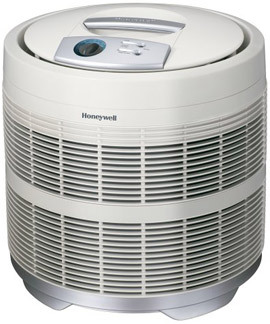 I give you the Honeywell 50250-S Pure HEPA Filter Air Purifier. The AHAM certification is extremely important, and Honeywell know this. This certification is closely connected to the CADR (Clean Air Delivery Rate) which consists of three rankings, each one representing how efficiently filtered air is delivered. The higher the number, the better the machine because it filters the contaminated air particles in question quicker, giving great results. The rankings for this specific purifier are 250 for pollen, dust and smoke. These numbers, as far as I’m concerned prove how efficient this air purifier is and it’s also excellent at neutralizing odors. 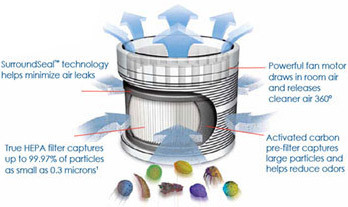 The purpose of the activated carbon pre-filter is to capture bigger particles that are floating around in the air. This helps the unit to neutralize all harmful pollutants, as well as eliminate odors. It also extends the life of the pure HEPA filter because all lint, fur and other large particles don’t get stuck to it. I would first like to mention that the Honeywell 50250-S is designed for fairly large spaces, up to 400 square feet. This makes it perfect for use in large rooms around the home, or in an office. One big advantage is the recommendation of this model by doctors. The permanent HEPA filter captures airborne pollutants such as dust, pollen, mould spores and pet dander and guarantees that 99.9% of them are completely filtered. This gives great benefits to people prone to allergies or those who have a weak immune system, which is why this unit has impressed so many docters. Another useful advantage is that the HEPA filter can be vacuumed which means it can continue circulating the air 5 times in an hour for the next five years without the need to replace it. The Honeywell air purifier is truly a “one of a kind” air cleaner. It contains patented 360-degree airflow making the intake and release of air even more efficient. Having the benefit of 360 degrees helps circulate air all over the room thus, making it possible to place it anywhere you desire. The Honeywell 50250-S features three different settings concerned with air cleaning. That way you can change it according to your desire. However, I have come across complaints that this model can be noisy so bear that in mind if you’re sensitive to this. As far as indicators are concerned, you have one big advantage. You don’t have to think about replacing or cleaning your filters because the Intelli-Check Electronic Filter indicator lets you know when the filter needs to be cleaned, or replaced. No more guessing games for you! When we take into consideration all the pros such as efficient filter technology, 360-degree airflow and Intelli indicators as well as the slight cons such as noise and not such an attractive design, there is only one thing left to do – give the final verdict! Overall, this air purifier displays remarkable performance and customer satisfaction is way above average. I have personally come across many comments from people who suffer with allergies, and have seen drastic improvements. So, if this is something that appeals to you, have a look on Amazon. The last time I checked this air purifier out, they were offering some great deals on price!